We’re a not-for-profit group made up of experts in road safety from across Hampshire and the Isle of Wight – from representatives from the emergency services, to charities, local authorities and businesses specialising in keeping older people on the road. From Monday 1st October to Friday 5th October 2018, and in support of Older Peoples Day (Oct 1st), the forum is holding an Older Driver Awareness Week offering advice and tips that will help older drivers continue to drive safely or help them to decide when to stop. Hampshire Police and Trading Standards want to remind people not to be pressured into signing up for services and goods that they don’t actually need. 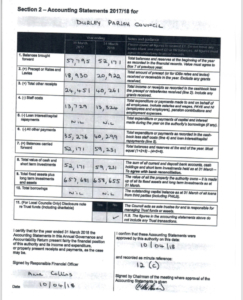 If you are ever visited or cold called by people offering services such as loft insulation or other ‘energy home improvements’ never be swayed into signing anything on the spot. If you feel uncomfortable and the person refuses to leave tell them you are calling the police. Older more vulnerable members of our community are being deliberately targeted and these companies are using scare tactics to get them to agree to totally unnecessary expensive work. They may also mention you are entitled to a Government grant, or you will be fined if you don’t have the right energy saving measures in place. The ‘sell’ may start with a free loft insulation check. Durley Parish Council recognises that when personal information is provided (such as name, address, e-mail address, telephone number, organisation) this information will be stored to enable us to contact you and respond to your correspondence, provide information and/or access our facilities and services. Your personal information will not be shared or provided to any other third party unless it is to answer your correspondence. Durley Parish Council will only collect a limited amount of information about you that is necessary for correspondence, information and service provision. We do not use profiling, we do not sell or pass your data to a third party. We do not use your data for purposes other than those specified. We make sure that your data is stored securely. We delete all information deemed to be no longer necessary. We constantly review our privacy Policies to keep it up to date in protecting your data. If you have a complaint regarding the way your personal data has been processed you may make a complaint to Durley Parish Council and the Information Commissioners Office casework@ico.org.uk. Telephone 0303 123 1113. 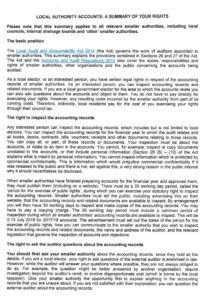 Under the Freedom of Information Act 2000, Durley Parish Council is required to maintain a retention schedule listing the record series which it creates in the course of its business. 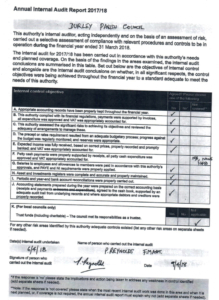 The retention schedule sets out the length of time which the record needs to be retained and the action which should be taken when it is of no further administrative use to Durley Parish Council. 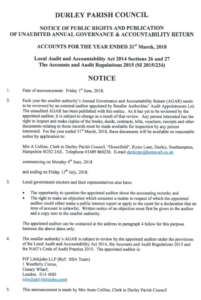 The schedule below shows how Durley Parish Council retain their records for audit. PLEASE NOTE: Documents are stored in the Clerk’s Office or in the County Archives at Winchester. This statement summarises how Durley Parish Council operates their Data Protection Policy. 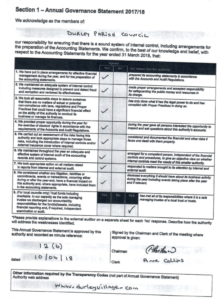 Durley Parish Council accepts that they have a responsibility to comply with the Data Protection Act 1998. This Act regulates the use of personal data. Durley Parish Council accepts that The Data Protection Act 1998 sets out high standards for the handling of personal information and protecting individuals’ rights for privacy. It also regulates how information can be collected, handled and used. The Data Protection Act applies to anyone holding information about people electronically or on paper. Durley Parish Council has a number of procedures in place to ensure that it complies with the Data Protection Act 1998 when holding personal information concerning its residents. Durley Parish Council has notified the Information Commissioner that they hold personal data about individuals. Personal data is processed fairly and lawfully – this means that data should only be collected from individuals if staff and Councillors have been open and honest about why they require the information. Personal data is processed for specific purposes only – data should not be used for any other purpose. Personal data is accurate and kept up to date – data should be correct if not accurate. Personal data is relevant to what it is needed for – data will be monitored so that too much or too little is not kept, therefore only data which is needed will be held. Personal data is not kept longer than it is needed – data will be removed if not required. Personal data is processed in accordance with the rights of the individuals – data must be used for the purpose that the individual gave the permission for. Personal data is kept securely – this means that data can only be accessed by staff and Councillors. Data cannot be accessed by members of the public. Durley Parish Council recognises that it is their responsibility to be open with people when taking personal details from them. This means that staff must be honest about why they need certain information. 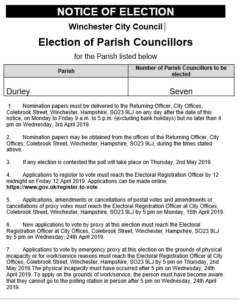 Any information given to a member of staff or member of Durley Parish Council will not be passed onto a third party unless it is to be used for the purpose it has been given to the Parish Council. Durley Parish Council may hold information about individuals such as their addresses and telephone numbers. These will be kept in a secure location and will not be available for public access. Any personal data held on the computer will be deleted if out of date or not required for the use it was given. An elected member may need to access personal information to help them carry out their duties, this would be done via the Parish Clerk. Information should be given to help carry out the specific purpose. 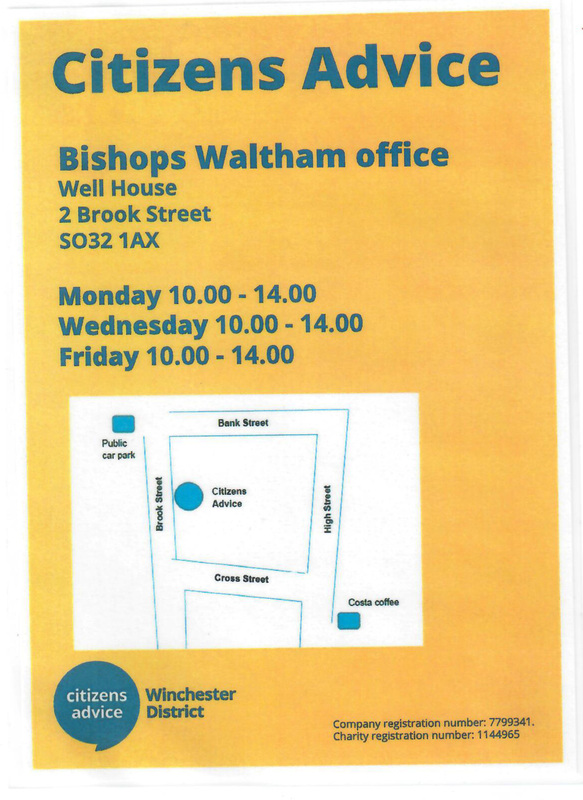 Access should only be given to sensitive information with consent from the Parish Clerk. Data should never be used for political reasons unless consent from the individual has been given. 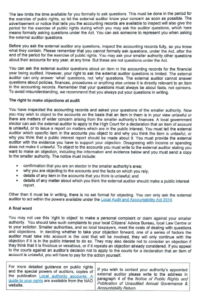 Durley Parish Council staff and Councillors must be aware that when complaints or queries are made, they must remain confidential unless the individual gives permission otherwise. When dealing with personal data, this must also remain confidential.